PMT has an assortment of available solutions for mounting peripheral devices such as: in-car video capture devices, mobile printers, keyboards, and other components that complement our in-vehicle mobile office solutions. PMT offers a variety of solutions for mounting keyboards into your vehicle. First we offer a range of keyboard specific trays that hold your keyboard without needing to permanently attach your keyboard onto a mount due to the spring loaded thumb latch that is built into our keyboard trays. This allows users to remove the keyboard from the tray easily and place it in front of them on their lap or against the steering wheel shall they wish for increased comfort. We also have a universal adapter that can allow fixed mounting of the keyboard as well. The trays can then be attached to a separate keyboard arm mount that will allow independent adjustment of the keyboard from the computer, or a “Dock-Keyboard Clamshell” which positions the external keyboard tight to the computer similar to a laptops footprint that will allow you to fold the screen down on top of the keyboard. The mounts can be installed onto a number of PMT consoles or pedestals. The final solution can then be easily adjusted and positioned for ergonomics and use, with swivel, tilt and fold-down capabilities. They securely hold the printer and paper roll via a spring loaded latch for safety and convenience. Both versions are designed for easy paper roll change-outs without the need to remove the printer from the mount. Both versions can be bolted directly to any flat surface, or can be configured with optional pads and additional brackets to act as armrest printer mounts compatible with any of our console Systems. 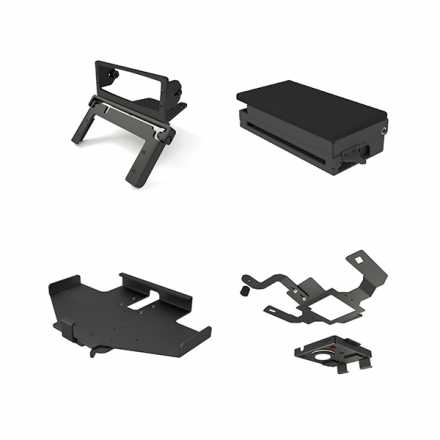 Our standard printer mounts support Brother® PocketJet® 7, PocketJet® 6, and legacy Pentax PocketJet® 200, II, 3 (Plus) versions, and are finished in high quality black epoxy powder coat for durability. The PMT “heads-up” Radio Dashmount is available for both Ford Interceptor Sedan and Utility and conveniently positions a radio control head and a siren/light controller up on the dash. The PMT “heads-up” Radio Dashmount is available for both Ford Interceptor Sedan and Utility and conveniently positions a radio control head and a siren/light controller up on the dash so that the most vital and most often used controls are at eye level. The siren/light controller portion is on a flip up hinge so that operators retain instant access to the dash controls underneath. The unit is easy to install and made of lightweight yet rugged aluminum construction. PMT has a long history of producing quality in-car video mounting solutions for many different vehicles and mounting requirements. From dash-mounted forward facing camera mounts that allow for easy adjustments and also position the camera away from airbags, to headliner mounted solutions with integrated wireless mic base stations. We have simple brackets for mounting secondary cameras in the rear passenger area of vehicles as well as remote camera activation switches and CPU mounting hardware. We can build mounting solutions into our consoles as well that allow for a very clean and un-obtrusive install. We offer solutions for most major in-car video equipment providers so contact us today to learn more.